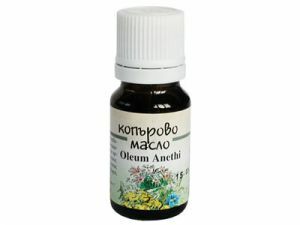 Action: soothing, lekosanotvorno, antispasmodic, antiseptic, expectorant, wound healing, anti-itching, hypotensive, kravoprechistvashto stimulating appetite antiritmichno, laxative, anthelmintic, diuretic, stimulating menstruation, lowering excess sexual energy, aids digestion, brings toxins from the body, diuretic. Indications: insomnia, depression, sores, itchy skin, allergic dermatitis, acne, bronchitis, pneumonia, vomiting, hiccups, stomach, bowel and spastic colic, spastic constipation, flatulence, worms, difficulty urinootdelyane, edema, cystitis, gout, hemorrhoids, hypersexuality, stimulating menstruation, indigestion, lack of appetite and kidney stones, alcohol poisoning, inflammation of the gums. Contra: for epileptics, apply limited in nursing mothers, pregnant women and children, in individual intolerance to the oil. Contraindication baths with essential dill oil. Internal - under medical supervision! Usage: lamp, air freshener, bath, massage.